I made this beaded bead back in 2010 and submitted to Beads & Beyond jewellery magazine where it was featured. Since then I’ve taught a few workshops here in the UK and USA at an artfest. As I don’t have a studio to run workshops from now I have decided to put the tutorial up here for you to use for free. Free beaded jewelry designs – Swarovski necklace and earring set – Looking for ways to make glamorous beaded jewelry designs? Use this easy tutorial for making an eye-catching Swarovski necklace and earring set. It’s easy, versatile and worth trying! Free pattern for beaded necklace Crystal Ice. free-beading-necklace-pattern-1. U need: seed beads 11/0. bicone beads 3 mm. bicone beads 5 mm. pearl beads 8 mm. crystal drops. With this short tutorial, you will learn how to do right angle weaving technique and form a circle. 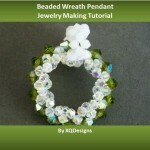 You will also learn how to make a bail, a technique that you can use on other beaded jewelry designs. Create a dangling earring using chains and this is one of the many ways how to use chains. The design is limitless. You can attach as many chains and beads you like and make it long or short. You can also use different sizes of beads. The tutorial will teach you the basic way of linking components, a simple but essential technique in creating wire jewelry.